Review, extra pictures and credits after the jump! When I first thought about shooting “Dysis” from Rfyre, I sampled various hairstyles trying to find something that suited the mysterious feel of this ensemble. I think the obvious choice would have been some untamed tresses, lending a romantic air. But as I experimented with different skins, I suddenly saw Dysis as less of an elegant gothic outfit and more dark, almost post-apocalyptic. Raven Pennyfeather’s costumes are always inspired and nicely textured, this time in tactile embossed leather, bright metallic tones, soft blood-red velvet. The “jacket” is actually a floor-length leather cloak with collar, accessorized with upper and lower sleeves, extended on the glove layer. A mesh shirt on the undershirt layer is topped with leather lace-up shirt on the jacket layer. The leather pants include sculpty prim cuffs (not shown). Finishing off Dysis is a shimmering silver belt double wrapped around the waist. 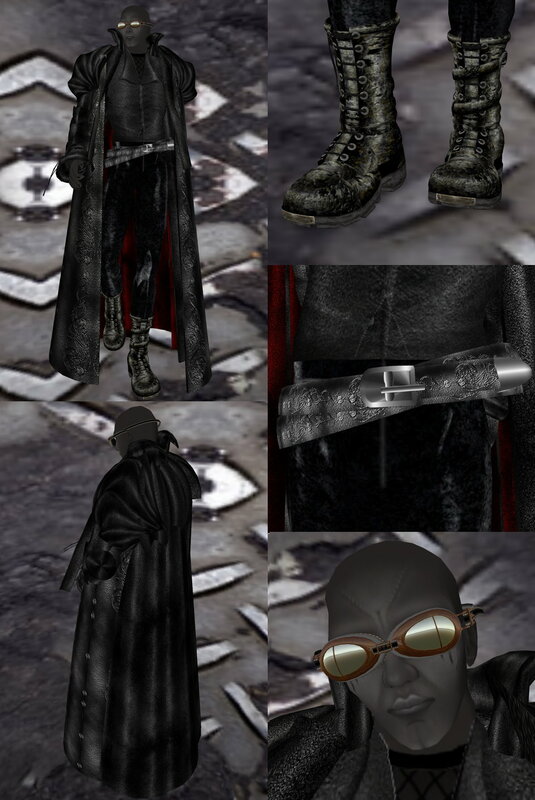 To complete this outfit, I chose Gutterblood Spoonhammer’s stompy and distressed futureterror boots, still specially priced at 100L. Left boot features an outside buckle and right boot a small outside pocket. The special anniversary glasses from Ottico fit perfectly, I think, with transparency anti-intuitively set to 100%, giving the glasses a mirror lens. And underneath it all, the wonderful Black Demonic Skin Claw by Sezmra Svarog, from Nora BodySkins, unfortunately not available anymore. Sezmra is a talented long-time skin designer who recently closed up her shop for good, giving up doing business for money in Second Life for her new endeavor, giving away not only her last women’s skins but the Photoshop files themselves so anyone can customize the skins to their liking. This creative spirit, not the sadly more common desire to get rich, quickly or otherwise, in SL, is pretty inspiring. Hearkens back to the original purpose of SL before it became a land of ad parks and overpriced duplicates of real life fashion. Thank you, Sezmra, for your part in renewing that spark of what used to make us happy to log in here. edited to add: I’ve received a few IMs in world addressing the comments I made about Sezmra. I have no problem with people who make their living on SL by putting their creative energy into creating…the problem I have is with people who only put their creative energy into marketing, while creating duplicates of real life clothing. Sorry if that wasn’t clear in my text. Nouveau chez / New at: JCS, Philotic Energy, Rfyre. In these times when dramas about content theft are running all over the grid, with “collateral” witch hunts and false accusations, it’s nice and comforting to see how great designers can INSPIRE each other in the best way. All through history, artists have gathered to share and vivify their creativity. Artists of the same field, of course, but also artists from different fields. So, i’m showing today Raven Pennyfeather’s last creation “Castaneda,” the new creation from Eponymous trenchmouth “Toltec,” and to go along with them, a new hair from another great artist, Aemilia Case from Philotic Energy, “Saxon” that comes in her so good new 96 textures. I have to say it was a pure pleasure to put together items designed by such master-texturers! “Toltec” comes in two colors (clay/olive and black/red); in each pack, copy or transfer following your needs, you will get 3 sizes. Choose the size that looks best with your build. Adjust your foot size to 0 (unless you’re going barefoot). That way, you will have always the best fitting with any shoes (except sandals!). To get the best posssible appearance, it may be necessary to adjust the length and flare of your pants. As usual, the textures are carefully designed, the building is ultra-precise, with an attention to detail I wish I could find more often in sl. These Toltec have relatively high heels for men. In my humble opinion, they go better with historical costumes or fantasy outfits than “RL-like” outfits. Fortunately, Raven Pennyfeather designed her “Castaneda” to perfectly fit the “Toltec.” It comes in two colors, Earth and Noir. Each color pack offers, as usual at Rfyre, many items and attachments, allowing more than one look (a mere 11 items in each pack!). Attachments and pants are modify, jackets and shirts aren’t. If you have issues with the length of the sleeve showing under the sculpty cuff attachment (these are perfectly designed and textured) like i did, Raven will provide you modify versions of them. “Castaneda” offers all the creativity you are used to getting at Rfyre! JCS Toltec Clay/Olive, PE Saxon Ash Black Tipped, and Castaneda Earth. JCS Toltec Black/red, PE Saxon Steel Black Tipped, and Castaneda Noir. Full credits after the jump! Woke up today feeling kinda gothic, and nothing better for that than the new release from House of Rfyre. The Timeless outfit comes with 13 separate pieces, everything highly detailed, giving a very realistic look. It has a pair of prim shirt cuffs which gives a very nice movement when you walk and a long, very detailed jacket. This outfit has been paired with Shiny Things’ black old boots. This new outfit, Eminence II by Raven Pennyfeather, is an interesting combination of elegance and whimsy. 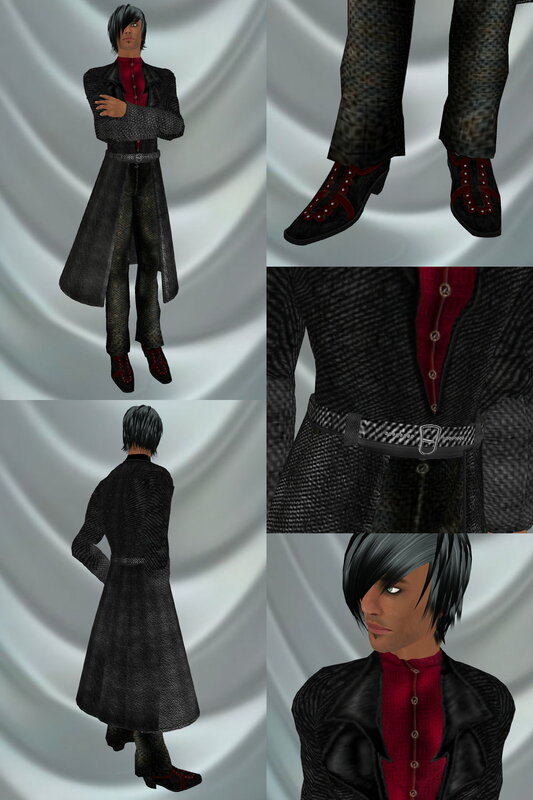 It includes three jacket styles all with silver button accents: one closed with burgundy satin lapels (shown), closed with black satin lapels, and open with black satin lapels; black satin slacks; shoes; a set of detailed black laced cuffs (very impressive! ); a white satin shirt with silver button detailing; a black and burgundy accented collar with attached bow; a collar without the bow; and a full length flexi-prim black satin cape. Accessories include an ebony cane with silver accents, a set of black gloves, and an annoyingly non-moddable black and burgundy top hat with ostrich feather. Rather than look like the Mad Hatter in some version of Alice in Wonderland gone bad, I opted to sit on the hat instead. It was comfier than I expected! 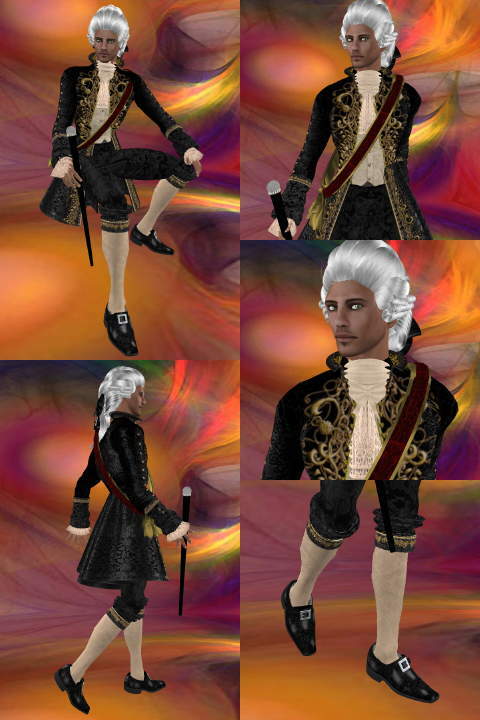 With Eminence II, I’m wearing Billie II hair from Philotic Energy (in black, of course). 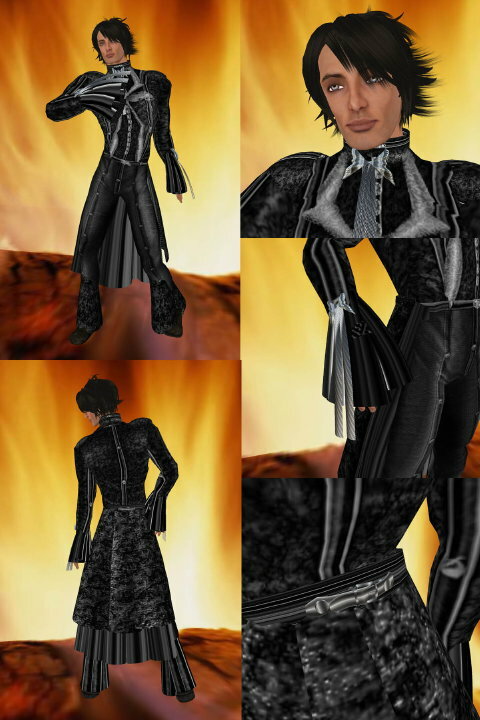 This 15-piece outfit includes the following: Black Leather Boots With Silver Accents (5 pieces), Upper Caped Jacket (Flex Prim), Lower Surcoat (Flex Prim), Collar (Prim), Leather BlackSilver Jacket High Neck, Leather BlackCrimson Jacket High Neck, BlackSilver Bracers/Sleeve extensions, BlackSilver Pants in both Boot and Long Lengths, Leather Shirt Open Neckline, Leather Vest Open Neckline. With all these components, you will be able to create many different looks! I love the futuristic look of this outfit, and particularly the fabric’s textures. 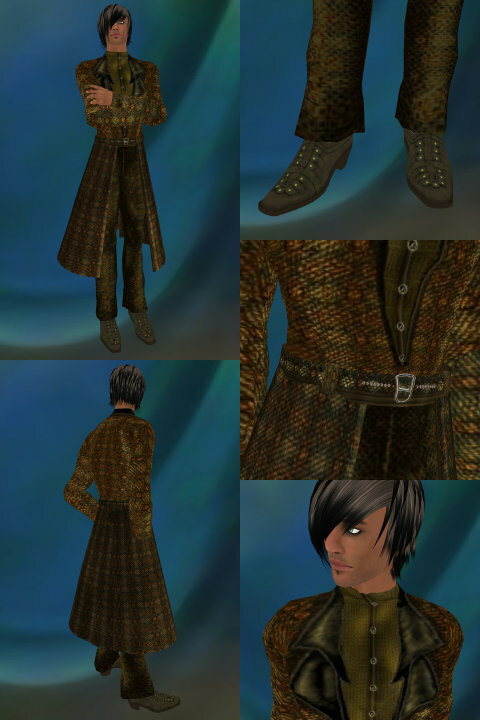 Beyond doubt, Raven Pennyfeather has a talent for texturing. I’m less enthusiastic about the prim work, especially the shoes. Seeing what the amazing shoemakers we have in sl do, I have become very demanding! Everything is no-copy/transfer, Prim attachments are moddable except for the boots, the pieces of clothing are no moddable except for the pants. You can get the pack for 800 Lindens. A matching women’s wanderer outfit is available for the same price. For a limited time, drop a notecard to Raven Pennyfeather with your transaction number to receive: Wanderer BlackRed Pants in both Boot and Long Lengths and the Wanderer Leather Shirt BlackCrimson Open Neckline. Showing another luxurious costume by Raven Pennyfeather for Rfyre today! Two options for the shirt (enbroided or silk), two for the pants (long and short), many prim attachments and shoes come in the pack. Everything is moddable and transfer but the shoes. Three colors available (shown) for 700 Linden each. Enjoy! I’m using the brand new “Jack” skin by Posy Trudeau for her new brand “Flesh Peddlers.” I was just starting to work on a big “skin post with many pictures”, when I saw that Ryan was way faster than me on this! Go take a look at his review here! Jack comes in many versions: 6 facial hair with and without eyeliner, tan and light, and many “specialties” like “Scarred,” “Eyeblack” or “Camo,” and the unique for now (to my knowledge) “dirty.” This skin is sold for 500 Lindens. Well, after “Tete a Pied,” “Flesh Peddlers” shows us that men can now have good skins for only 500 Lindens! At this price, it’s easy to be tempted with something special for a certain occasion! Flesh Peddlers sells shapes as well; the ones for men are done by Vasean Talamasca and are sold for a very low 200 Lindens. These quality shapes are obviously MODIFY! Talking about shapes, I was told that the biggest scammer of a shape seller, well known for selling overpriced no modify men’s shapes, just started to sell some moddable ones! Well, still scandalously overpriced for shapes pretty inferior to the others on the market (these guys should at least TRY to learn the basics of human anatomy), but it’s better for the customers. I’m glad that the blogs as well as the shoe makers were explaining to the customers how important it was to get modify shapes lately!